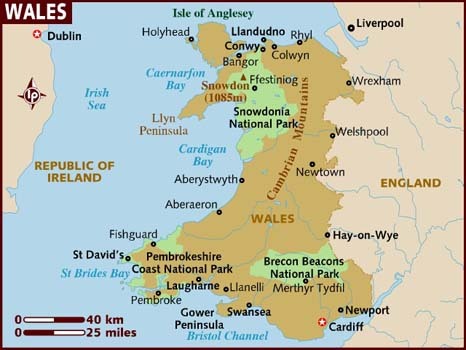 Part of the United Kingdom, Wales is a small country-slightly larger than Lake Ontario and also roughly the same size as Clark County, Nevada (the county that houses Las Vegas). Conquered in 1282 by Britain's Edward I, the country briefly gained its independence in the 15th Century before being annexed by England as part of the Laws in Wales Act (1535-1542). The Industrial Revolution had a great impact on Wales. Mining and metallurgical industries grew exponentially, moving the country from an agrarian society to a manufacturing society. 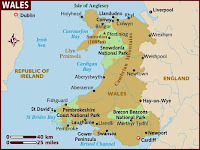 Located on the southern coast on the Bristol Channel, Cardiff and Swansea became industrial centers, and as a result were heavily targeted by the Germans during WWII. Cardiff was one of the largest coal ports in the world, and suffered over 2,000 bombs and lost nearly 400 people. The Cardiff Blitz occurred from July 194 through May 1941 during which attacks were regular and virulent. During one ten-hour period, more than one hundred bombers dropped incendiary bombs, high explosive bombs, and parachute mines. Llandaff Cathedral was damaged as well as over 350 homes. Bombing raids were fewer, but continued through 1944. Over a three day period in February 1941, more than 35,000 incendiary and 800 high explosive bombs were dropped on the port city of Swansea. The resulting fires were so prevalent, they could be seen across the Bristol Channel in Devon. 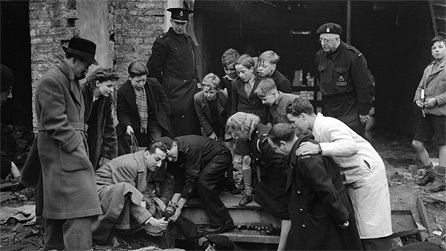 According to Vor Lloyd who was ten years old at the time, "A fire engine stopped outside our house, but most of the firemen and the men in the chain (water bucket brigade) were killed when a high explosive bomb dropped in the spot." "There wasn't much chance of a sleep," says Terry Jones. "I remember clearly sitting on the low garden wall seeing the fire and explosions, then a slight delay before the 'crump' of the explosions was heard up in the valley." People endured the attacks with bravery and stoicism. Within some communities there was looting of bomb sites, but more often than not families, neighbors, and strangers helped each other.